AIR GAUGES & GAUGE PANELS. COMPLETE BRACKET & BAGS KITS. ONBOARD & AIR SOURCE KITS. 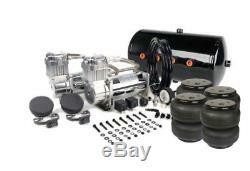 Viair 480C Chrome Air Compressors w 5 Gallon Tank & Air Lift Dominator 2600 Bags. 1832 Lone Star Rd, Mansfield, TX 76063. 480C Viair Compressor Chrome Dual Pack 200 PSI Max. Combo Deal includes two compressors, (4) Air Lift 2600 & bags with a standard 1/2 Single Port, & a 5 Gallon 8 1/2 Port Steel Tank. This compressor also comes with remote mount filter assemblies and mounting hardware. The 5 Gallon 8 1/2" Port Steel Air Tank is measured at 24"L x 10"D x 12.5"H.
There are (4) 1/2" ports on the front, (1) 1/2" port on each side, (1) 1/2" port on the top, & (1) 1/2" port on the bottom of the tank. Viair 480C Dual Compressor (Chrome). 5 Gallon 8 1/2 port tank - (4) Air Lift DOMINATOR 2600 Bags. Duty Cycle: 100% AT 100 PSI (50% AT 200 PSI). Air Tank Size: 10 Gallon. 12V Amp Draw : 44 AMP (22AMP Each). Dimensions: 10.87"L X 4.2" W X 6.75 H (Each Unit). (2) 480C "Chrome" Air Compressors. (2) Sets of Remote Mount Fittings. (2) Sets of Spare Air Filter Elements. (6) Airline Clips with included Hardware. (8) Sets of Nuts, Bolts, Washers & Lock Washers - (1) Heavy Duty Tube Style Fuse Holder (up to 60- AMP fuse). (1) One Heavy Duty Pressure Switch (165 PSI ON, 200 PSI OFF) Plus minus 5% of Max. (2) Stainless Steel Braided Leader Hoses with Inline Check Valve. Airline (For Remote Mount Filter Installation). Air Lift 2600 Lbs Bag Specifications. Design height: 6.0"-9.0". Top fastener: 3/8 - 16. Bottom fastener: 3/8 - 16. Mounting hole center: 2.75" (Top) Bottom 1.75" Apart between 3 Holes. 20" L X 12.5" H (W mounting feet) X 10 DIA. One on top & one on bottom. Port size = 1/2 NPT. WARNING: This product can expose you to chemicals including lead, which is known to the State of California to cause cancer and birth defects or other reproductive harm. Newmatics Inc is a family owned company, established in 2008. We are authorized dealer for all major Air Suspension companies in USA. We sell only major brand name authentic, 100% genuine parts. We are located at 1832 Lone Star Rd, Mansfield, TX 76063. We will answer your question or concern within 24 hours. International Customers (including Mexico & Canada) - Please Note. We cannot under-value merchandise or mark the items as a gift on custom forms & Invoices. This is against US and international laws. Please make sure, your address information is correct and up to date. All return items must be authorized and approved by us. Your feedback is very important for us. We will definitely resolve it. You can leave us a voice message, someone from our staff will get back to you same day or within 24 hours regarding the help and assistance needed. The item "Viair 480C Chrome Air Compressors w 5 Gallon Tank & Air Lift Dominator 2600 Bags" is in sale since Wednesday, May 22, 2013. This item is in the category "eBay Motors\Parts & Accessories\Car & Truck Parts\Suspension & Steering\Lower Kits & Parts". The seller is "newmatics" and is located in Mansfield, Texas. This item can be shipped worldwide.